It is Veteran’s Day today. Google decided to pay homage to the fallen troops by creating one of the best doodles to date. The doodle is interactive and tells heartwarming stories of veterans who put their bodies on the line for their country. Google did not leave any stone unturned when it came to making this Doodle as authentic as possible. 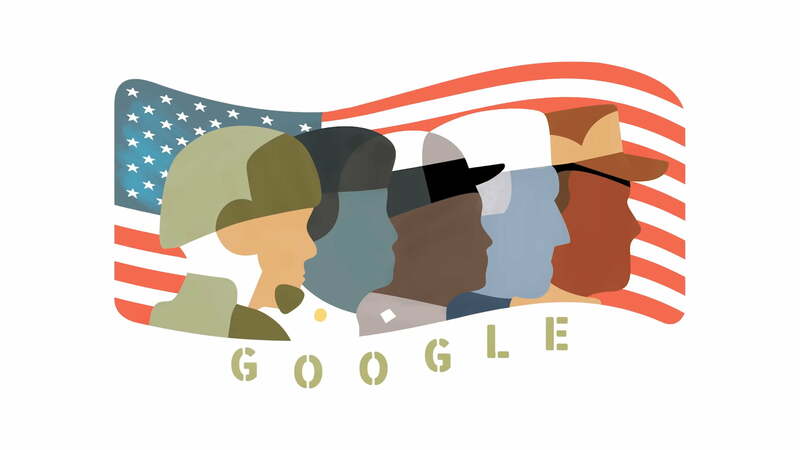 The search engine collaborated with many organizations to design and develop a doodle that would pay a touching homage to all the US veterans. Google teamed up with StoryCorps, Google’s internal employee veteran network (VetNet), and animation studio Foreign Fauna. The doodle is narrated by five army veterans who share their personal war stories. Each army veteran belongs to a separate wing of the army. These five branches are Air Force, Army, Coast Guard, Marine Corps, and Navy. These stories are extremely touching and private. They can instill a range of emotions in a person, including everything from rage to happiness, love to sadness, and fear and hope. This doodle is a part of a much bigger campaign, known as the #VeteransVoices initiative. The initiative helps users connect with veterans and lets them hear their stories. The initiative is in part due to a partnership with StoryCorps, Google, and YouTube. StoryCorps’ goal is to collect and preserve meaningful incidents and stories throughout history. The #VeteransVoice initiative remembers and acknowledges veterans’ sacrifices by listening to their war journey. The StoryCorps smartphone app lets users interview a war veteran, and then send the interview to the Library of Congress, to be archived. The #VeteransVoices hashtag allows users to share their or their loved one’s story to YouTube and other social media platforms as well. Foreign Fauna served as the animation team that created this tear-jerking doodle. Guest animators Alicia & Emory Allen, both of whom have parents who spent their entire life in the army, did a fantastic job with the animation. When you click on the doodle, an introduction is played explaining the doodle. The introduction explains that it will have stories of five veterans from the five sectors of the military. Each veteran’s story is of approximately one to two minutes in length. The doodle captures users’ attention quite remarkably, despite each story being only two minutes long. The animation is simple and subtle, but it captures our imagination eloquently. The animators at Foreign Fauna used muted colors with simple character outlines and shading. The first story is about a lady called MaCherie who had the tough job of doing patriot details when a soldier was killed in battle. She was the Technical Sergeant of the US Air Force Alaska. The second story is about Keith and Roy and the undying bond they had developed early on in their army careers. The third story is about Zach who told his story to his son Scott. This was an extremely emotional story as Zach had to seek treatment for his Post-Traumatic Stress Disorder. Scott was aware of the weight his father was carrying after returning home. The fourth story is about Frank who was only seventeen when he joined the Navy. The fifth story is about Olivia, a 103 war veteran and the first black woman to join the Coast Guard. This is not just a tribute to the veterans; it is also an eyeopener for the millions of users who visit Google for a search query. The stories are short enough that they capture the essence of what a veteran has to go through during their military career. These stories will help realize what it feels like to walk in the shoes of a veteran. It will also bring a few tears along the way as well. So, what do you think of the Veteran doodle?